During my PhD research, I found that scholarly articles about legal education (particularly those in my area of interest – practice-based legal education) had few citations. For example, in studying the literature about Australian practical legal training published during 2006-2012 I found 10 articles listed on Google Scholar, World of Science, and Scopus, of which only 2 were cited in other literature. It seemed to me that this literature struggled for visibility in the field, let alone influence. In my thesis and elsewhere, I’ve argued that social media provides a means to improve the visibility and influence of legal education research and scholarship. I decided to experiment with my recently published article. After the article was published online, I posted 4 tweets/day for two weeks, with a link to my article. I also posted 2 tweets/day to the whole issue of the journal in which my article appeared. Each tweet was slightly different, highlighting a specific issue in the article. After the first day, I used Buffer to automatically queue and send the same tweets. It is important to note that the publisher allowed me to share 50 free downloads via a special link – I distributed the special link in some tweets, and via sites such as LinkedIn, Academia.edu, and ResearchGate. [See postscript below] The GIF below includes a chart that counts the number of online reads and downloads, and a chart for the altmetrics, for each article in the issue published online (8 articles). My article (shown as X) scored highest in both charts. The almetric score is a way of measuring social media visibility. The charts show that by Day 14, the read count for item X (at 253) was greater than all the other items combined (Day 15, however, saw a leap in the altmetric and read score for two other items). It is a rudimentary experiment, but I would argue that in this case, the visibility of my article was improved by social media interactions. Hopefully, improved visibility would lead to improved engagement and impact, too. 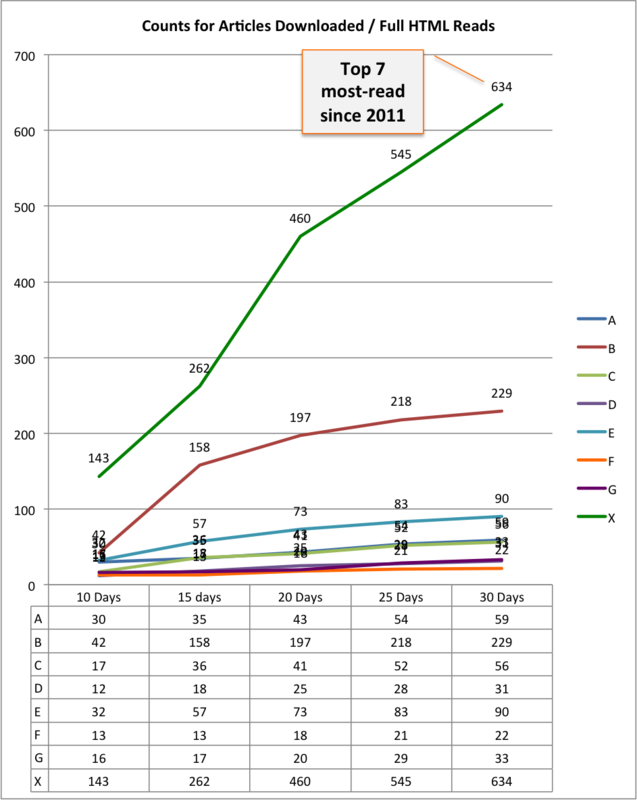 I kept plotting the number of reads/downloads for all the items for 30 days. The chart below shows the result in 5-day increments. By Day 25, Item X was in the top-10 most-read articles in journal since mid-2011, and by Day 30 it was the 7th most-read item. This entry was posted in Legal education, publishing, Twitter. Bookmark the permalink.